楂见之欢音译乍见之欢。见到你的第一眼就喜欢，寓意愿你吃到的每一颗山楂都能为你带来满心欢喜。logo的中文字体笔划中的“横”末尾处采用替换，用代表山楂的圆形替换掉之前笔划尖锐的三角形，使字体看起来更圆润平滑，给人一种轻快愉悦之感，而又点名主题。中文字体成正方排列的形式又让logo整体有圆有方，轻松中不失一丝规矩。搭配英译版字体“快乐的山楂”，希望每一分快乐都藏在山楂里，下一秒就被你品尝到。Hawthorn see the sound translation of the first sight of the joy. The first time I see you, I like it, which means that every Hawthorn you eat will bring you full joy. Logo's Chinese font stroke is replaced at the end of the "horizontal" stroke, replacing the sharp triangle of the previous stroke with a circle representing Hawthorn, making the font look more rounded and smooth, giving a sense of lightness and pleasure, and naming the theme. Chinese fonts into a square arrangement of the form and let the logo as a whole round and square, easy in a bit of rules. 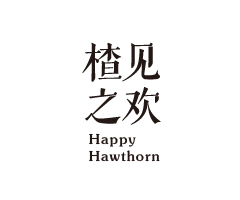 With the English translation of the font "Happy Hawthorn", I hope every minute of happiness is hidden in the Hawthorn, the next second will be tasted by you.